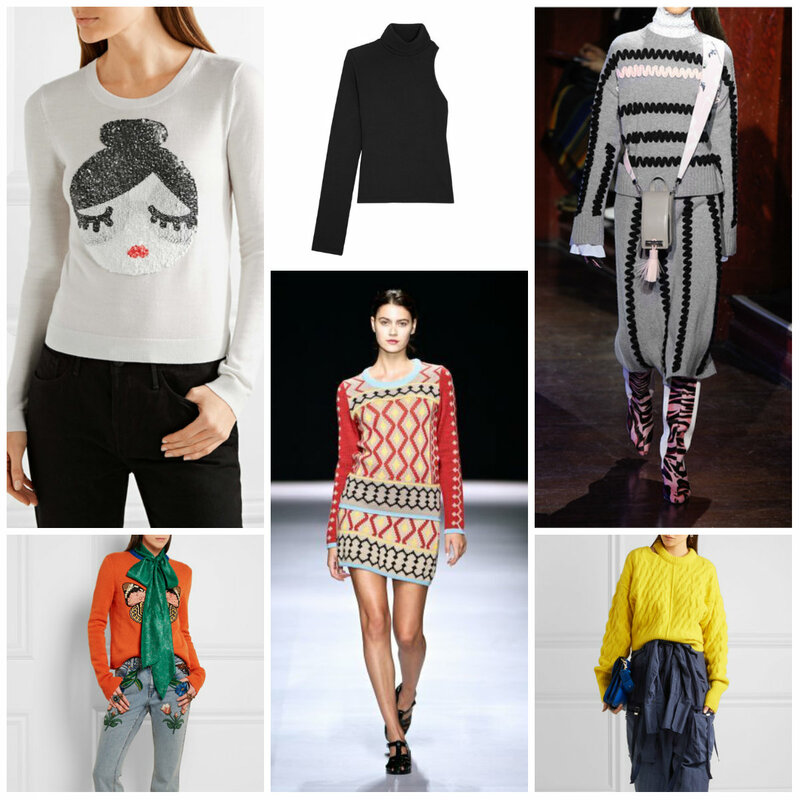 Are you hoping to break out of the ugly holiday sweater trend this year? Fashion Studio Magazine selected 10 ultra-stylish pieces for Fall/Winter 2016. From effortless, refined elegance by Maje and funky embroidered designs by Gucci to colourful Xhosa patterns by Laduma Ngxokolo, there is something for everyone this season. 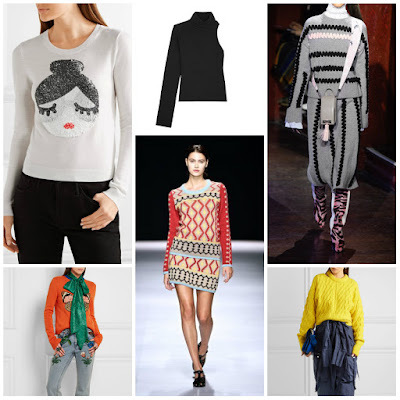 Alice Olivia's 'Stace Face' sweater is embellished with reversible sequins that playfully depict founder Stacey Bendet - brush them to the left or right to reveal eyelashes or sunglasses. It's knitted from soft stretch-wool and has a slightly loose fit. Style yours with jeans and statement boots. 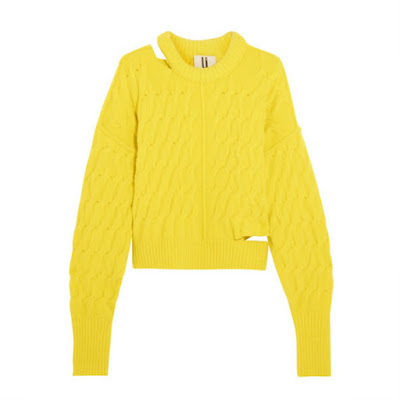 Seen on the runway this September, Topshop Unique's yellow sweater pays homage to the eclectic spirit of '80s London. This cozy style is knitted in a cable pattern and finished with subtly distressed cutouts. We like how the exaggerated ribbed cuffs add volume to the sleeves. 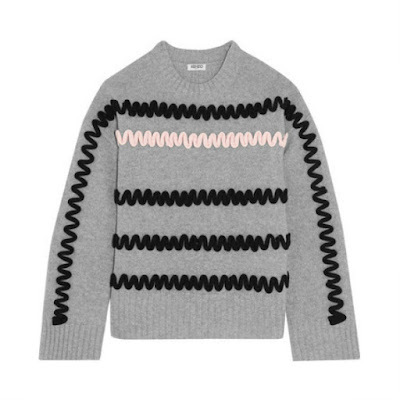 KENZO's sweater is playfully detailed with pale-pink and black zigzag appliqués. It's knitted from light-gray wool and has a ribbed back panel and trims for added coziness. We like the Fall '16 runway styling - it was layered over a white blouse and teamed with the coordinating skirt. 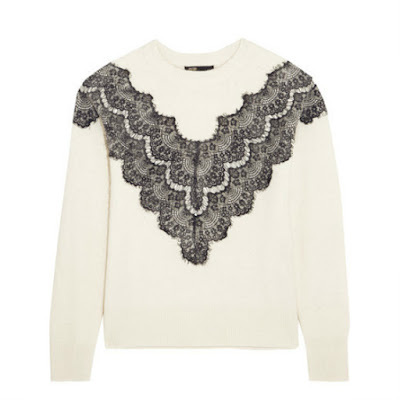 Maje's 'Malto' sweater perfectly encapsulates the label's feminine sensibility. Knitted with touches of wool and alpaca for softness, this versatile cream style is detailed with an elegant black lace panel. Wear yours with everything from tailoring to jeans. 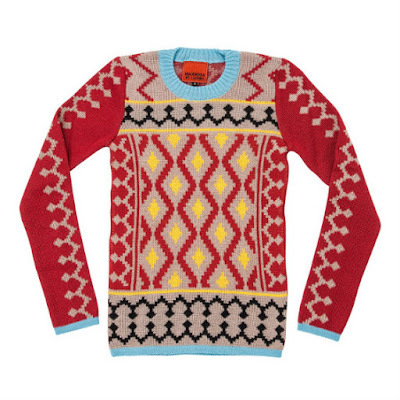 MAXHOSA BY LADUMA knitwear was started in 2010 by South African designer Laduma Ngxokolo. Along his journey into exploring astonishing traditional Xhosa beadwork patterns, symbolism and colours, he discovered that they would be the best source of inspiration for the knitwear, which he then reinterpreted into modern knitwear. Beaufille's 'Portia' sweater is cut in a sleek one-shoulder silhouette - a key trend this season. 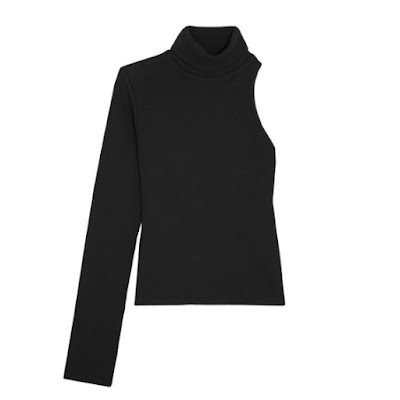 Designed to flatter, it's spun from smoothing ribbed-knit and defined by its single sleeve and turtleneck collar. Wear yours tucked into the label's 'Sinope' skirt. 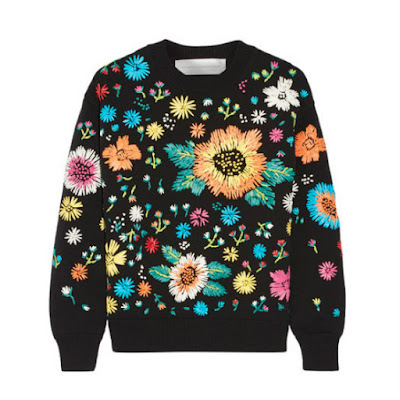 A standout piece from the label's Fall '16 collection, Victoria, Victoria Beckham's knitted sweater is embroidered with colorful blooms made from faux raffia. This piece has a loose, boxy fit. Wear yours layered over a striped shirt and jeans. Nature provides unlimited inspiration for Gucci Creative Director Alessandro Michele. 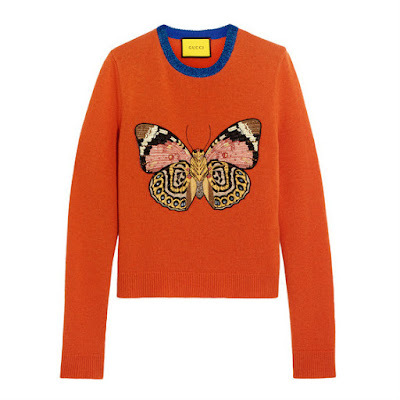 Ornately embroidered and embellished with sequins and beads to create a butterfly, this orange wool sweater has a lustrous metallic blue trim and long cozy sleeves. Wear yours with the label's flared jeans, also part of the exclusive collection of modern fashion icons. Chinti and Parker's sweater is crafted from sumptuous cashmere for the softest feel against your skin. 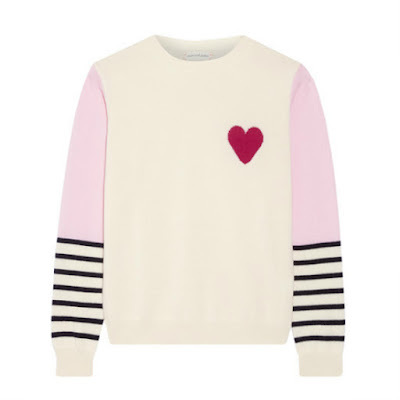 This cream design is woven with color-blocked pastel-pink panels, contrasting stripes and the brand's signature heart intarsia - giving it the perfect dose of personality. Wear it with everything from feminine skirts to sporty track pants. 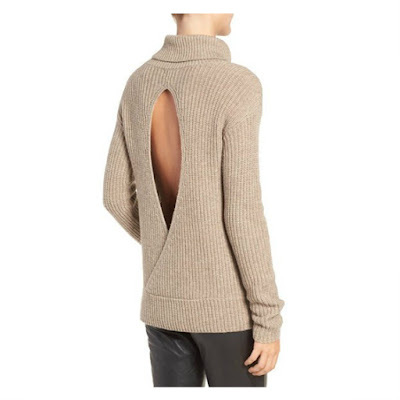 A hint of luxurious cashmere softens a rib-knit turtleneck sweater styled with slouchy dropped shoulders and an open keyhole back for a dramatic, skin-flaunting twist. Designed in collaboration with international style icon Olivia Palermo, this cool-weather look embodies her widely admired sense of style: classic, with a dash of fashion-forward edge.